Learn more about events at either Big Star location by calling us at 312-860-1315 or submitting an inquiry below. Cooking Classes: Join us with a group of 6 to 12 colleagues or friends for a private class to learn how to make some of your Big Star favorites. Available Sunday through Thursday evenings in our commissary kitchen in Wicker Park. Cocktail Classes: Focused on our extensive tequila and whisky selections, come taste through a family of spirits and learn to make some of our classic cocktails. Available day or evening hours at our Wrigleyville location for groups of 10 - 30 guests. Wicker Park: The covered (or enclosed in winter) atrium space is available for groups of 15 - 75 guests for a 2 hour function. Wrigleyville: The 2nd floor of the restaurant is available for semi-private functions for groups of 15 - 150 guests. This floor has flexible seating options, TVs, separate sound system, views of the stadium, and large windows that give it an open-air feel. Wicker Park: Host a cocktail-style event for up to 160 guests in the winter and up to 250 in the summer. 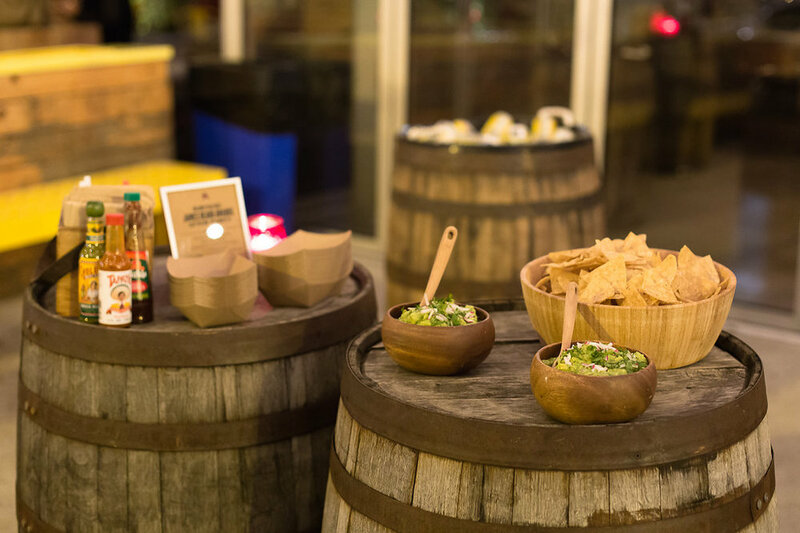 Wrigleyville: Utilize both floors of the restaurant as well as the outdoor patio for up to 350 guests.